One sweaty New York City day last month, my friend and I ate snails for lunch and durian for dessert. I don’t know why we did this, but something about how affordable everything is in Chinatown encourages me to make strange decisions. I didn’t dislike the fruit’s taste, which was somehow both sweet like custard and meaty like steak and onions. We didn’t notice the smell as we ate the fruits’ sections standing on the sidewalk, of course—New York smells like rotting garbage anyway. Later that day, my friend stepped off the subway, leaving me behind so he could vomit onto the subway tracks. I don’t know if the snails or the durian did it, but I smelled my finger and also gagged. All-in-all, it was a great Saturday. Anyway, durian has a long hate-it-or-love-it history for Western tasters, but is eaten throughout Southeast Asia. Even there, folks are familiar with its unique, sulfurous odor—the fruit is banned in public places in Singapore. But where does it get its scent from? Researchers have already studied the cocktail of chemicals responsible for the smell (in which sulfur obviously plays a large role), but not the actual genetics. A team of Singaporean scientists sequenced the durian genome to find out. “Despite the importance of durian as a tropical fruit crop, durian—related genetic research is almost nonexistent,” the team wrote in the paper published today in the journal Nature Genetics. The researchers specifically sequenced the Durio zibethinus, a popular durian species, and found its genome contained almost a billion base pairs—those are the As, Cs, Ts and Gs that make up the letters of the DNA encyclopedia. They also looked at the RNA—a different kind of genetic material that’s essentially a copy of a part of the DNA’s instructions used by the cell to produce proteins. 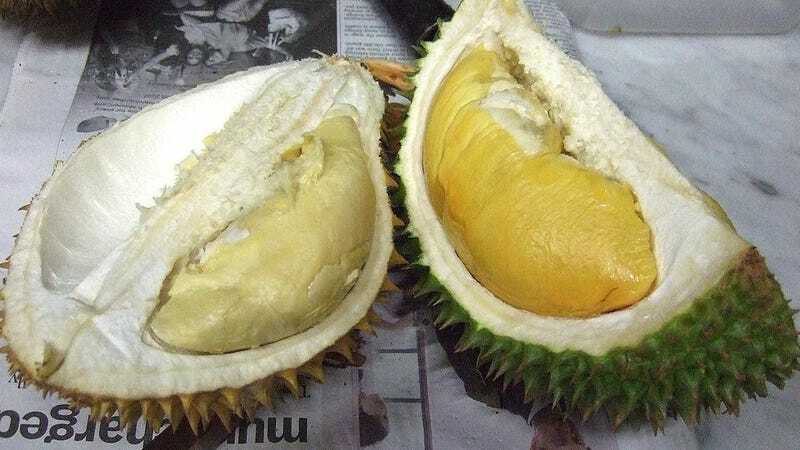 The durian fruit’s cells produced more of the sulfur-producing proteins than the rest of the plant did, like one enzyme called methionine gamma-lyase (MGL). It also produced more of an enzyme associated with ripening called aminocyclopropane-carboxylic acid synthase (ACS). Other plants have the MGL gene, the authors noticed, but the durian has four copies compared to only one in cacao plants. The researchers propose that some time in its evolutionary history, its entire genome doubled...twice. And together, ACS and MGL could be behind the smell-producing pathway process. That’s just an inference based on a correlation, though. Further study “will be required to establish a direct causal link between these molecular entities,” the researchers write. Ultimately, the research is important simply for establishing a scientific and agricultural understanding of the popular fruit, as reported by Nature. But aren’t you glad you now have an idea of how durians produce their smell? Me too.